Corals are an invaluable part of the marine ecosystem, fostering biodiversity and protecting coastlines. But they're also increasingly endangered. Pathogenic bacteria, along with pollution and harmful fishing practices, are one of the biggest threats to the world's coral populations today. One of the solutions to the crisis may lie in human medicine. Prof. Eugene Rosenberg of Tel Aviv University's Department of Molecular Microbiology and Biotechnology, working in collaboration with Dr. Ilil Atad of his own laboratory and Prof. Yossi Loya of TAU's Department of Zoology, has developed a treatment for coral infected by Thalassomonas loyana, otherwise known as White Plague disease. This deadly bacterium infects 9 percent of Favia favus corals on the Eilat coral reef in the Red Sea and readily transmits the disease to nearby healthy corals. Their treatment uses viruses that infect bacteria by injecting genetic material into the bacteria, a therapy originally developed to treat bacterial infections in humans. In this case, the researchers isolated a virus called BA3, one of a category of viruses known as phages. After laboratory experiments showed that BA3 had the ability to kill off White Plague disease, field experiments in the Gulf of Eilat demonstrated that the treatment stopped the progression of the disease in infected corals and prevented the spread of the disease to surrounding healthy corals as well. These findings were presented at the American Society for Microbiology's general meeting in June. 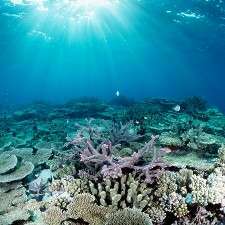 Treating bacterial infections in corals is no easy task. Because corals don't produce antibodies like humans, they can't be immunized. And pharmaceutical antibiotics are not a viable option because the treatment releases the drugs into the sea, harming the marine environment. The researchers applied their treatment to two groups of diseased coral, each surrounded by a circle of healthy corals. In the test group, the researchers injected the virus into the area at a concentration of 1000 per milliliter. The control group did not receive the virus. After 24 hours, the difference in the outcome was highly significant, says Prof. Rosenberg. In the test group, the infection of the diseased coral ceased its progression, and the disease did not spread to the surrounding healthy corals. In the control group, however, the White Plague disease progressed rapidly in the original infected coral and spread to seven out of ten of the surrounding healthy corals. One of the most surprising discoveries during the course of their research, says Prof. Rosenberg, was that some corals naturally posses the beneficial virus and are already resistant to infection by the pathogen. When the researchers tested the three corals in the control group that remained uninfected, they discovered that the virus was already present in their biological composition. "We found that this is a natural process that goes on all the time. What we are doing is only shifting the situation in favor of the virus," he explains. This method of developing an antidote to specific pathogenic coral bacteria is a crucial breakthrough, Prof. Rosenberg says. Corals in different regions of the world are infected with different pathogens. For each location, it is necessary to isolate the appropriate virus. But microbiologists should be able to develop regionalized treatments based on the methods used by Prof. Rosenberg and his fellow researchers. The next step is to develop an effective way to spread the viruses over large areas of an infected coral reef. Sufficient amounts of these viruses can be easily manufactured in the laboratory. After that, it's a question of technology and funding, Prof. Rosenberg adds.